Choosing to live in a retirement community that offers resort-style amenities and close proximity to top tourist attractions is a great way for older adults to make the most of living in Florida. Whether you’re planning to fully retire or simply cut back on your work hours, you’ll have more time on your hands, and you don’t want to run out of things to do. That’s one of the reasons that Bear Creek is the retirement community that so many adults 55 and older have chosen to call home. 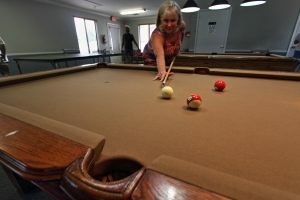 With our enviable location just outside of Daytona Beach, FL, and three clubhouse complexes packed with amenities that promote exercise and social interaction, you’ll find plenty of activities to keep you busy, inside and outside our gates. Plus, just outside our gates, you’ll find a beautiful golf course that’s open to the public. And long walks on the beach, charter fishing excursions, and plenty of sightseeing opportunities are available only a few minutes away by car. To learn more about our beautiful retirement community and the affordable Florida lifestyle that’s waiting for you at Bear Creek, contact us today.